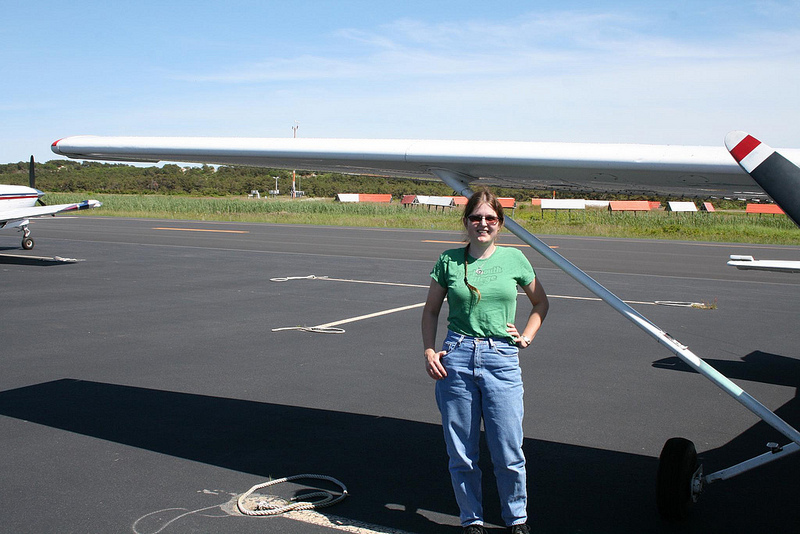 Both Sides Now: IFR and VFR to Providence and Cape Cod – EHFC Members Talking! I recently took a cross-country trip to Providence and Cape Cod with my husband. The idea was to go someplace fun and also test out my brand new instrument rating. The original plan was to fly to Providence (KPVD) and be based out of there for a couple of days, doing day trips to destinations like Nantucket, Martha’s Vineyard and/or Cape Cod. Of course, things didn’t quite go as planned (when do they ever in aviation?) but it still turned out to be a great trip and my instrument rating came in very handy. The trip involved both VFR and IFR segments, and served as a good illustration of the advantages of both styles of flying – hence, of course, the title of this post. By the way, if you would like to see more photos from the trip, you can find them here. Before I start on the story, I would like to highlight some of the differences between VFR and IFR flying, since I know some of this blog’s readers are not IFR pilots. Indeed, I have often thought that private pilot training should include some basic explanations of IFR procedures because we all share airspace and frequencies with IFR traffic. I remember being mystified by a lot of the IFR terminology on the frequency when I was still a VFR-only pilot and wishing I understood where all that traffic might be. The trickiest part of IFR flight is often descent and landing; to do this safely in the clouds without hitting any terrain or other traffic, you may have to follow a particular approach procedure (“shoot an approach”). An approach is just an official step-by-step descent procedure, specifically tailored to a given airport and a given runway. To shoot an approach, you might fly to one waypoint at a particular altitude, then descend to a lower altitude and turn towards a next waypoint, etc. The approach typically positions you on a long straight-in final to the runway, which explains why the commercial flights are always on “a seven-mile final” or so when they come in to Ithaca and the rest of us are in the pattern. However, if the weather conditions are pretty good and you are out of the clouds early enough, you may not have to shoot a formal approach; instead you do something called a “visual approach” where you make it to the runway on your own. ATC may sequence you a bit, or tell you to enter the pattern, or just tell you “cleared for the visual” and leave you free to choose how you approach the runway. So, back to my trip. As the date approached, I realized that it would be difficult to stick to the original plan due to weather. The forecast was calling for reasonable weather on Sunday and Wednesday, when we were planning to travel between Ithaca and Providence, but questionable weather for Monday and Tuesday, which did not bode well for the VFR day trips. Unfortunately I had limited flexibility in scheduling the trip, and couldn’t move it; so, I decided we would go and make the best of whatever weather we encountered. In the worst case, we would rent a car instead and explore the area by road. Sunday was a great day with wonderful weather. We took off for Providence in the morning and were there by lunchtime. I filed IFR for the practice, but the weather was beautiful VFR throughout, with just a brief overcast layer below us over the Catskills. I filed and received a direct clearance to Providence; however, somewhere in the middle, I got rerouted by Boston Center to put me on the WIPOR2 arrival. This was a good exercise in entering new waypoints into the GPS and maintaining situational awareness. However, once I was handed off to Bradley approach, they routed me direct Providence again. Arriving at Providence, they had me fly the ILS 34 approach — I assume for spacing, since the weather was completely clear. It was a gorgeous approach, with vectors for a very extended downwind over Narragansett Bay and then a turn inbound. I found Providence to be a great airport, very friendly to small planes despite being quite busy with commercial traffic. I never felt like the controllers were annoyed at me for breaking their flow — if you’ve ever visited a busy NYC airport, you know what I mean. There was a good number of other small planes on the airport as well, all sharing the runways, the airspace and the ramp with the big guys (see photo!). The FBO was very nice and the staff was extremely helpful throughout our stay. All the Providence controllers were also very helpful and willing to provide clarifications whenever I asked. The staff at the FBO was extremely helpful as well and really did not seem to treat us any differently because we had arrived in an older Cessna 172 and not in a fancy business jet. We had lunch at a nearby restaurant and discussed what to do next. Because the weather was gorgeous and forecast to worsen, we decided to move one of our planned day trips to that afternoon. 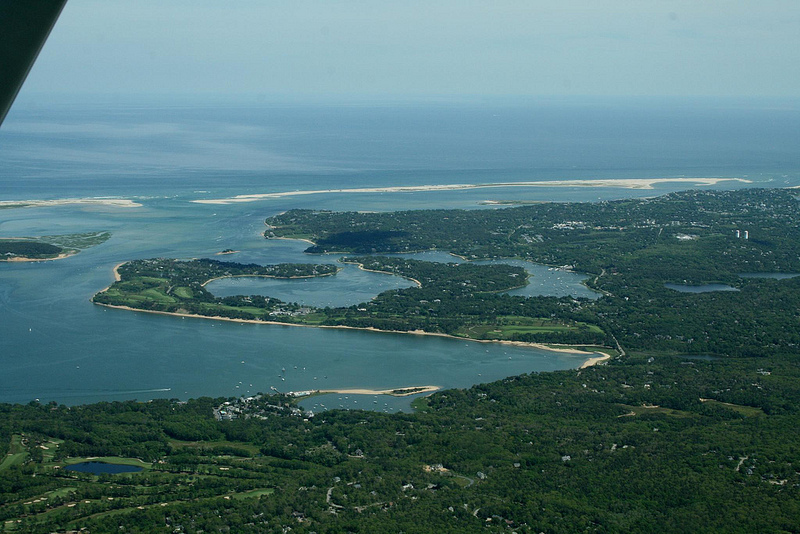 We decided we would fly to Provincetown, at the very tip of Cape Cod, and then back. This we proceeded to do – VFR this time. Flying VFR felt great and very liberating after months of mostly IFR during my instrument training. It was great to have the flexibility to change altitude at will and to pick the most scenic route. We were under flight following with Cape Approach, but there was very little traffic in the area anyway. This surprised me a bit, but I found later that early June is not yet considered summer/high season in the area, so there are fewer tourists than there will be in a month or so. We made it to Provincetown and landed there. It’s a very nice little airport – though watch out, Runway 25 is “right pattern”! Once you land, you have to go into the passenger terminal and pay a $10 landing fee at the Cape Air desk. Once you pay they give you the code to get back on the ramp to your plane. We took a taxi into Provincetown proper and walked around for a while. The town is quite unique with its own style and atmosphere, which I really liked. We then took a bus back to the airport and flew to Providence. The total time I flew that day was 4.7 hours, which was a new record for me. The following day, the plan was to try for Nantucket. The weather was great VFR in the morning, but forecast to worsen in the afternoon. The forecasts for the afternoon were for ceilings to remain very high (9000ft+) and some rain. However, there were significant thunderstorms moving over NYC and heading our way, which seemed to conflict with the forecasts a bit. My assessment of the situation was that while we could make it VFR to Nantucket no problem, I had to be prepared to fly back to Providence IFR and shoot an approach in the clouds. I was really exhausted after all the flying on Sunday, though, so I didn’t feel ready to do that. I’m sure I could have managed it, but it wouldn’t have been enjoyable. So we decided to postpone that trip; instead, we rented a car and drove to Newport, where we had a great time seeing the town and the Breakers mansion. It turned out in the end that the weather did hold and we could have made it back from Nantucket VFR, but given how tired I was I still think canceling was the right call. On Tuesday, the weather was very bad with low IFR in the morning and then a warm front passing through in the afternoon. This was expected and we were not planning to fly anywhere anyway. We drove to Mystic, CT, where we enjoyed visiting Mystic Seaport and had a good time. Finally, on Wednesday, the weather improved. Our new plan was to fly to Nantucket in the morning and then head back home after lunch, potentially spending the night at an intermediate point like Albany to give us more time on Nantucket. The weather looked good in the forecasts and even in the phone briefing – it was meant to be good VFR, if rather windy and gusty. However, as we were getting ready to depart, I checked the weather again and Nantucket had dropped to MVFR. All the local airports – Martha’s Vineyard, Hyannis, etc – were rapidly varying between VFR and MVFR, and I decided I didn’t like the look of this for a VFR trip. We could have tried filing and flying IFR, but I didn’t think this would be as much fun and I also realized I was starting to come down with a cold. All around, it seemed like the most prudent option to head back home, particularly since the weather on Thursday was forecast to worsen again. So, we headed back to Ithaca, stopping in Albany for lunch. Incidentally, if you look at a chart it would appear that going through Albany should add considerable distance to this trip, but in reality the increase is only 11 miles. I guess these distances are long enough that great circles and map projections do come into play. I filed IFR out of Providence, as there were considerable clouds around — a cold front had just passed and had left a lot of “stuff” behind. We had a very bad headwind on the way out so the trip to Albany took almost 2 hours. I was in and out of the clouds a little on the climb, but at my cruising altitude of 8000 feet we were actually mostly in the clear, above a solid overcast. I did get rerouted on the way out of Providence as well, but this time I was not so surprised by it – in fact, I decided to just ask the controller for a vector to the first new waypoint while I sorted out the rest of the route. He provided the vector and all was well. 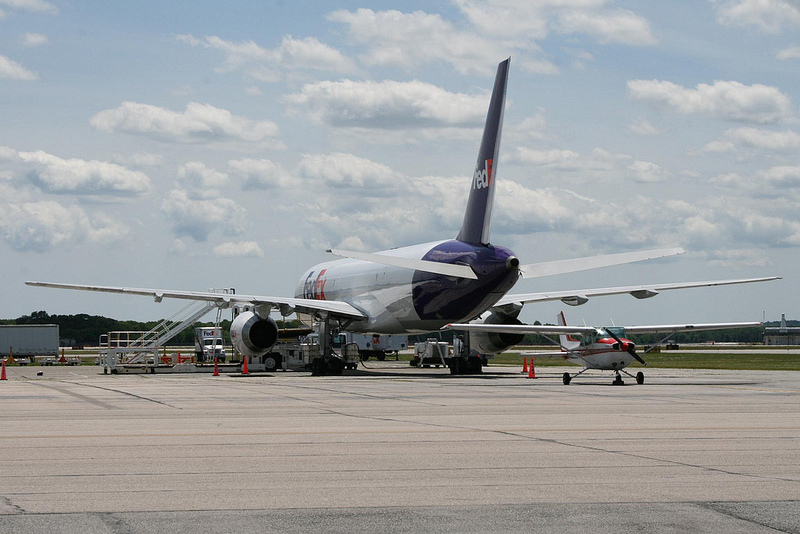 In Albany, there was nothing much interesting going on at the airport. We landed with a visual approach and taxied to the FBO. 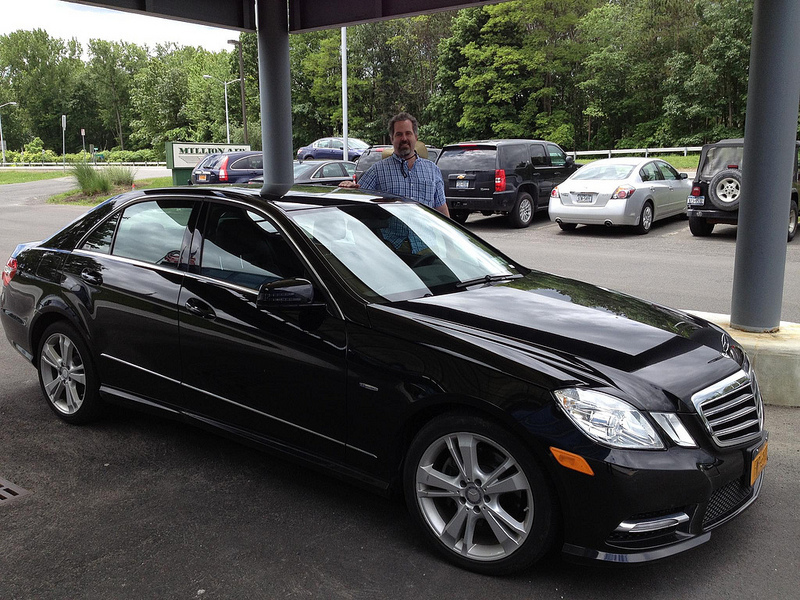 They lent us a great crew car (see photo) so that we could grab some lunch, and then we were off to Ithaca. Again, I filed IFR for simplicity and peace of mind; there were still significant clouds around and I did not want to have to do the “VFR cloud slalom”, particularly since I was getting tired and somewhat uncomfortable from sinus congestion with my incipient cold. The flight was uneventful, although we did encounter a bit more IMC (i.e. flying in the clouds) than on the previous leg. Generally, I was very happy to discover how simple IFR flying can be — particularly on a day when VFR would be a little unpleasant. I was checking the Ithaca weather while having lunch in Albany, and Ithaca was showing ceilings in the 2000’s; it was great to know I was IFR and so didn’t have to worry about a divert in case they dropped a little further. Anyway, we arrived into Ithaca and did a visual approach to 32, bringing us home. The total time heading back from Providence was 3.7 hours, with about 0.6 IMC. All in all, I’m happy with how things went. It is a bit disappointing that we didn’t get to visit as many destinations as I would have liked, but that’s the luck of the draw. Personally, I like to think of recreational flying as similar to mountain hiking/backpacking — there will be times where you cannot make the summit or your ideal destination for various reasons, and you have to be prepared to deal with that. There is always a next time. Still, there were many positives to this trip. The sightseeing flight up Cape Cod to Provincetown was wonderful, and I also got some very valuable practice in IFR cross-country flying. Although I didn’t encounter any really bad weather enroute and all my approaches were visual or in VMC, it was good to gain experience working “in the system” by myself with clearances, routes, re-routes and approaches at new airports. I am looking forward to expanding my horizons further with more trips this summer, including the big North Carolina trip which is hopefully taking place next month. Watch this space! Pingback: My First Bravo: Philadelphia Trip | EHFC Members Talking!